View basket “Happy Mother’s Day card” has been added to your basket. 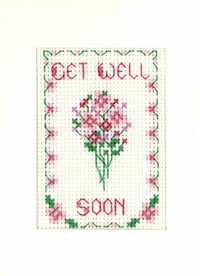 A cross stitch Get Well Soon card kit to make a thoughtful gift for someone who needs cheering up. The petite Get Well card has a pretty floral border in pinks, and a central motif of a glorious bunch of flowers. A mini Get Well Soon card with a pretty floral border in pinks, and a glorious bunch of flowers. This Get Well card kit contains top quality materials; Zweigart fabric, DMC threads, needle, card and envelope. The chart is clear and there are full instructions. This mini Get Well Soon card design is from the Decorative Textiles collection. 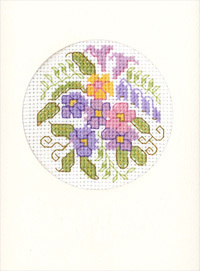 It is one of a wide range of cross stitch cards for birthdays and special occasions.